Back in January I went on a bit of a Kale Pesto kick. Oddly enough, it was all started by a frozen Kale Pesto Mac and Cheese meal that I found in the freezer section, LOL. I was intrigued by the name, and the use of Kale Pesto…that was new to me. 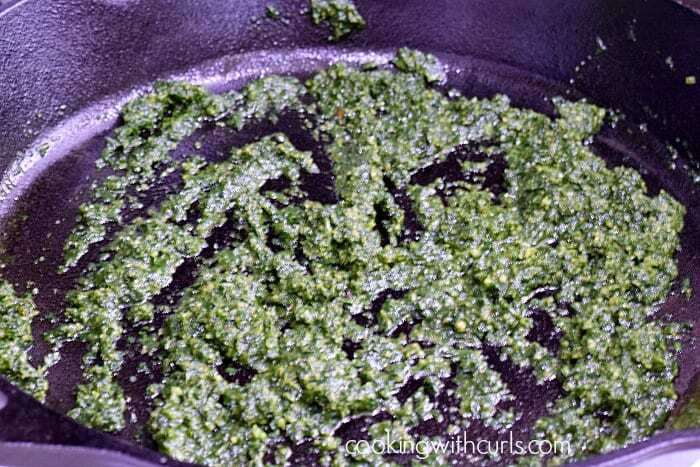 I love Basil Pesto, so I was more than willing to give it a try…and to recreate the meal at home….. 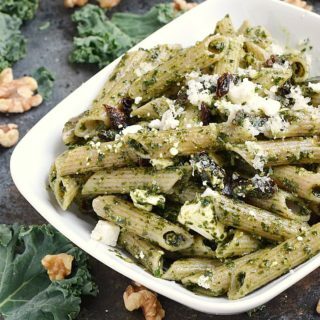 I have no idea what they called it Kale Pesto Mac and Cheese, it could have just as easily been called Kale Pesto Pasta. 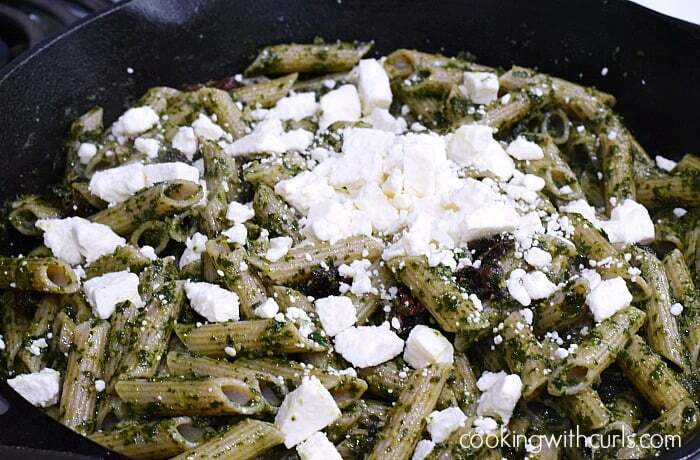 Maybe it’s because of the amount of Feta and Parmesan cheese, who knows, but I do know that it is delicious…and super easy to make! Heat olive oil in a large skillet over Medium heat. 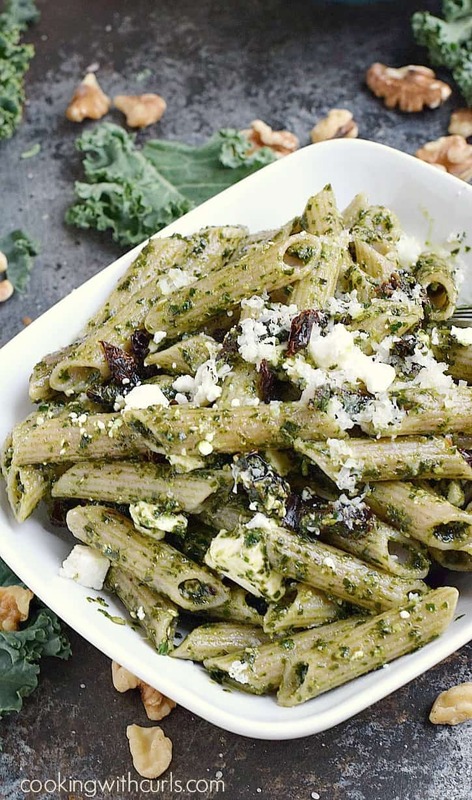 Add the Kale Pesto, stir until heated through…..
Add the pasta, sun-dried tomatoes, and Feta cheese. Toss to combine and cook just until heated through…..
Sprinkle on Parmesan cheese, toss to combine and serve….. I served mine as a main course, but it would also be perfect served along side Roast Chicken or Spice Rubbed Salmon…Yum! 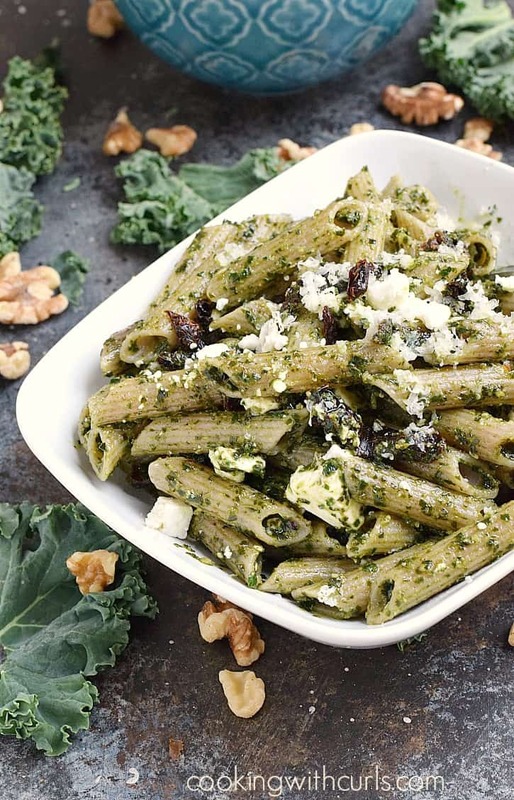 Kale Pesto Mac and Cheese is a healthy meal that is sure to be a hit with the entire family! Add the Kale Pesto, stir until heated through. Add the pasta, sun-dried tomatoes, reserved cooking liquid, and Feta cheese. Toss to combine and cook just until heated through. Sprinkle on Parmesan cheese, toss to combine and serve.